We've known from the very first look at Jared Leto's Joker that his version of the villain was something new. Yes, he'd still be sporting the white skin, green hair, and love of the color purple - but just like the rest of the Suicide Squad, this take on the DC Comics character would be - simultaneously - larger than life and completely grounded in the real world of criminal carnage. And at San Diego Comic-Con, we got another glimpse into the insanity of the Joker that fans may get to enjoy in the finished movie. Those averse to SPOILERS should stop reading now. While it's possible that what we've learned may only be conceptual, and therefore an idea that will not be appearing in the movie, if it is... it's guaranteed to be one heck of a scene. Because among the assembled collectible statues of the Batman (re-breather included), Joker, and Harley Quinn, there appeared one surprise character model that we had NEVER seen before. And if the Knightmare Batman collectibles spilled the beans on Bruce Wayne's eventual apocalyptic 'vision' in Batman V Superman, director David Ayer may have come up with his own take on the idea - either that, or the collectibles have once again spoiled a surprising, reality-breaking twist. Among the standard costumes and weaponry shrunken down from life-sized to collectible scale was one figure, dubbed 'The Joker (Batman Imposter Version)' that showed a very, very different take on the Batsuit as introduced in Batman V Superman: Dawn of Justice. Where the original appeared in various shades of grey and black, this was painted purple, with green gloves, boots and cowl, and more gold accents and blood than you could spot in one glance. But most importantly for those wondering what it means for the movie, it wasn't Ben Affleck's face beneath the cowl, but Jared Leto's. Not only that, but the Joker's now-infamous tattoos were carried over and recreated on the Batsuit itself, from the tattoo of the grinning mouth on his forearm, to the "Damaged" across his forehead (and even his metallic grin). If that didn't make it clear enough, the "JOKER" scrawled across the chest of the suit, the metallic knuckles and scalloped gauntlets getting gold plated, and the hands swimming in (someone else's) blood make it obvious this is the Joker's attempt at becoming the bat. Now, the questions raised by this figure - shown with an official title, and even without any of the prototype distinction seen on other models - are apparent to anyone even casually interested in the film. Because as odd as it may seem, the design was made for a reason... the most obvious being that it was made based off of a design related to, or appearing in the movie (and considering how trippy and offbeat the movie seems to be already, that's not all that surprising). Is this, as it's implied, a costume/design seen in Suicide Squad? And if so, in what context? Let's break down the two possible answers. For those who believe the simplest explanation is usually the correct one, this one is easy: the Joker gets his hands on a Batsuit, meaning he... well, got his hands on one of Batman's costumes. Which means accessing his subterranean Batcave - which may have been hinted at already, judging by the graffiti ("HAHAHA JOKE'S ON YOU BATMAN") scrawled across the chest of a Robin suit seen in Batman V Superman. 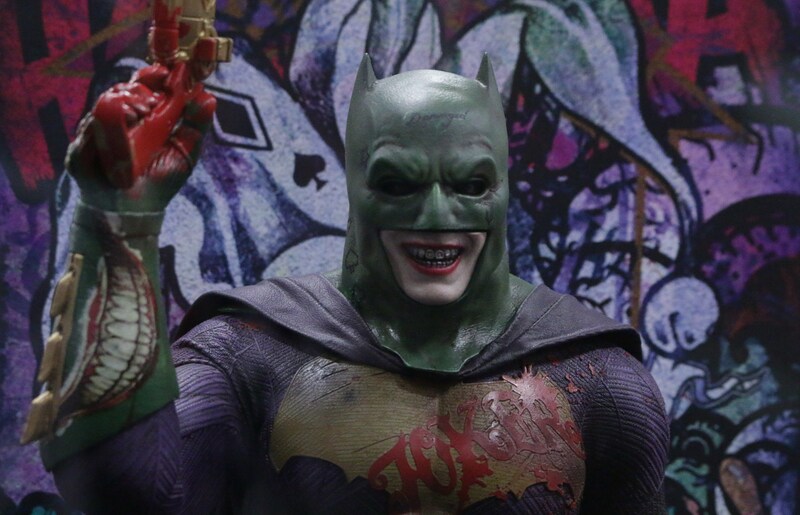 The studio has since confirmed that the costume belonged to Jason Todd, the version of Robin that also died at Joker's hands in the comic universe. So is it possible that Joker infiltrated the Batcave, made off with a suit to make his own, and left a loving message behind? Well, maybe. Maybe not. After all, since gaining access to the Batcave means he could do it again, it seems a bit irresponsible for Bruce Wayne to simply change the locks and continue as normal. Not only that, but since the cave is (presumably) located somewhere near the property of Bruce Wayne, such a plot twist would imply that Joker know's his enemy's real identity. That would be nothing new for the comic universe, but would still raise more questions than the appearance of a garish, blood-spattered Jokersuit is worth. What possible way could this movie's story include a scene in which Joker dresses up in a twisted, re-painted and co-opted Batsuit? What if he... doesn't? We already know two facts about the film: Joker and Harley's criminal world includes multiple references to Batman, from masked gunmen in Bat-masks to Bat go-go dancers. And on top of that, Joker and Harley's lifestyle is intended to be akin to "psychological warfare," including at least one alternate life they could have led which will be shown in the movie. So, if we know that the movie is finding time to show that kind on insanity, and mental instability is a fundamental attribute of... well, most of the cast, it almost seems most likely to be a fantasy. The question is whose fantasy? Is this Joker's obsession with the Batman taking physical form in his mind? Is it Harley's fantasy when Batman rescues her from the sinking purple supercar belonging to the Joker? Whatever the answer, we hope that fantasy/nightmare is long and elaborate (because the look is really starting to grow on us). Let us know what you think about the design, and how it should (or shouldn't) be worked into the finished film - and stay tuned to Screen Rant for more coverage of San Diego Comic-Con 2016.